Home #AlertKhabar How Hyderabad’s ‘Vehicular Traffic’ Increasing Pollution To Severe ‘Alarming’ Levels? The air pollution levels in most urban areas in India have been on the rise with major pollution sources being the increase in traffic volume and from industries, with Hyderabad being no exception. While industrial areas do contribute a significant amount to the air pollution levels in the city, the industrial areas are mostly restricted to the north-western part of the city and fall to a bare minimum in comparison to the pollution contributed by the traffic. An analysis of the pattern of increase in air pollution levels in the city suggests that there has been an overall increase in the major pollutants across the city, not just in industrial areas. This is indicative of the overall increase in the vehicular traffic across the city. Hyderabad has a population of 70 lakh and including Ranga Reddy district and the Secunderabad area, there is a floating population of nearly one crore. With a total area spread over 625 sq.km and with a road length of 9,250 km, the city has over 50 lakh vehicles out of which two wheelers account for more than 70% of the volume. Moreover, nearly thousand vehicles get added everyday to the existing volume in the form of registrations. Earlier, the business centres were mostly concentrated in and around the Hussain Sagar lake, within a radius of about 5-6 kilometers, with economic centres such as Himayat Nagar, Paradise, Ameerpet and Begumpet. But with development of the IT sector and MSMEs expanding, the new city has expanded around Hitec city and Kutakpally. Today, the growth and expansion of business centres has resulted in the spread of traffic junctions across the city. In 2010, the number of vehicles in the combined regions of Hyderabad and areas of Ranga Reddy district were nearly 27 lakh and currently, the number is estimated to be around 41 lakh, according to the estimates of the Hyderabad City Police. The daily diesel consumption in the city, including the Ranga Reddy district and Secunderabad areas combined amounts to nearly 2.4 mega litres per day and petrol consumption amounts to nearly 1.7 mega litres per day. While the increase in the traffic volume has been a matter of concern, the number of vehicles that simply do not adhere to the pollution norms and those that do not bother to get the pollution under control (PUC) certificate, has been a major roadblock towards curbing pollution levels. “More than 50% of the two wheelers and more than 90% of the four wheelers do not have PUC certificates. But what we have observed is that most commercial vehicles like taxis and goods carriers have their certificates updated regularly,” says M. Narsing Rao, Inspector (E-Challan) with the Hyderabad Traffic Police. Rao goes on to talk about the menace of two-wheelers and why there’s an appalling rise of two-wheelers in Hyderabad, compared to any other metro city in the country. The city which has a large network of internal roads makes the journey quicker and makes it easier to traverse. “The mild climatic conditions and the fact that the relative radius needed to cover for most business and personal activities in the city is just about 15 kilometres, which makes it ideal to travel on a two-wheeler than on a four-wheeler,” says Mr. Rao. While the overall pollution levels in the city are constant throughout, there’s a difference in the effect of the pollutants, given the surroundings and the layout of different areas. For instance, the situation in Gachibowli is quite different from the situation in the old city and the Charminar area. The narrow lanes of the old part of the city make it rather difficult for the easy dispersion of the pollutants of the air. Whereas the areas like Gachibowli, which are newly developed have room for the continuous dispersion of pollutants, thereby reducing the chances of pollutant inhalation by the residents. However, people living in the older parts of the city inhale larger amounts of pollutants, because of high suspension of particulate material, which is overloaded by the daily emissions. According to the National Ambient Air Quality Standards notified by the Central Pollution Control Board in New Delhi on November 18, 2009, annual arithmetic mean of PM 10 cant be more than 60μg/m3. The raise in PM 10 value doesn’t only tell the increase in pollution levels but also tells the present story of areas which are developing in Hyderabad. It is during the monsoon that the pollutants in the air come down considerably, but come winter, the suspension of the pollutants is felt particularly. Add to it, the period of Diwali exacerbates the situation because of the poor dispersion of the pollutants by the dense cool air. The areas on the downstream which are the most affected are LB Nagar, Uppal, Nagole, Nacharam, Saidabad, Saroornagar, Kothapet, Mansoorabad, Autonagar, Pocharam. The places which are on the upstream are Hitec city, Kutatpally, Banjara Hills, Jubilee Hills, Gachibowli, Raidurga, Manikonda and Nizampet. However, this doesn’t mean that the upstream places are not affected. These areas experience the impact of the pollutants during winters when the particulate material is suspended in the dense cool air of the winters. A recently published study from University of Washington has linked major health conditions arising out of PM 2.5 pollution levels. The study concluded that even meeting the present PM 2.5 standards of of 25 µg/m3 is not safe enough for preventing affliction with diabetes. Our NAAQS permits 60 µg/m3 of PM2.5. 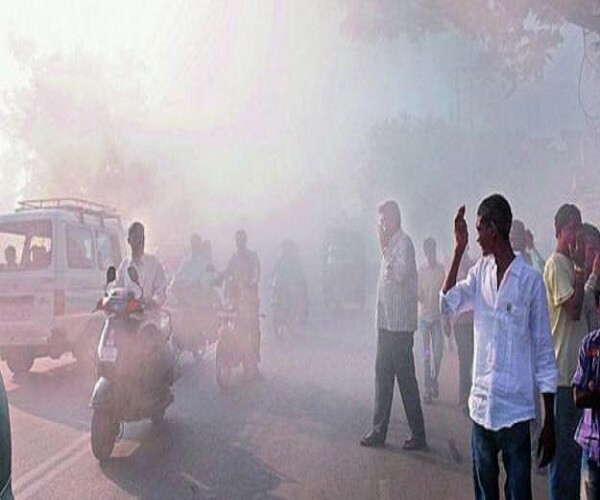 For the past few years, the air quality in Hyderabad has shown to exceed the national ambient air quality standards for particulate matter (PM), which are usually at an average of 82.2 ± 24.6, 96.2 ± 12.1, and 64.3 ± 21.2 μg/m3 of PM10, at commercial, industrial, and residential monitoring stations, respectively. And the national ambient standard is 60 μg/m3, which is way below the recorded levels. The PM10 pollution mainly consists of direct vehicular exhaust and road dust, according to a recent study done by Environmental Monitoring Assessment on the sources of particulate pollution in Hyderabad. The study also mentions about how PM2.5 particles have higher propensity to enter the human respiratory tracks come from mixed sources of vehicle exhaust, industrial coal combustion, garbage burning, and secondary particulate matter. In another study conducted by Sarath Guttikonda, Founder and Director of Urban Emissions, which looks at research and analysis of air pollution in different cities in the country, it was found out that the modeled concentrations for the urban area are 105.2 ± 28.6 μg/m3 for PM10 and 72.6 ± 18.0 μg/m3 for PM2.5. When these calculations were overlaid on a gridded population, it resulted in an estimated 3,700 premature deaths and 280,000 asthma attacks for 2010–2011. The analysis points to the urgency of the situation towards addressing pollution control measures in the city.